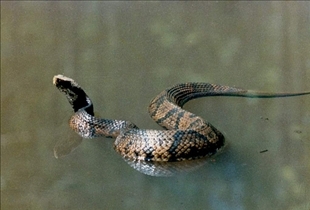 For most people who live in the southern United States, the Water Moccasin and the Cottonmouth are familiar and unique animals, with the latter often thought of as being slightly more poisonous than the former. We know now that these are two names for what operate as essentially the same creature, and that they are both deadly poisonous. It is easy to see why the two are often thought of as being different however, which is why we thought it fitting to reveal more about these fascinating snakes. The Water Moccasin or Cottonmouth is quite a large snake, and its muscular body can measure anywhere from 30 to 48 inches. The variety often referred to as Cottonmouth is actually closely related to the Copperhead Viper or Highland Moccasin which grows from 24 to 36 inches and it is quite easy to recognize given its triangular head and distinctive elliptical pupils. The body of the snake is typically colored brown with olive and black markings often present. Although the belly of the snake is a bit lighter in color, the same stripes and markings that can be seen on top go across the belly as well. The name Cottonmouth actually stems from the fact that white markings that look like a patch of cotton can be seen around the area of the throat. Both people who are familiar with the Water Moccasin and the Copperhead know that they coil up tightly and open their mouth in preparation for a strike. Regardless of what name it goes by, this is quite an aggressive snake to be sure, and it displays many of the same characteristics as highly territorial animals, including mammals. In fact, unlike most snakes that would retreat at an intruder, the Cottonmouth/Water Moccasin has been known to defend its territory aggressively and even advance toward intruders! Both the Water Moccasin and the Copperhead are highly venomous snakes, and they should be provided with the respect that they deserve. If you happen to chance upon one in the water, keep in mind that it is perfectly in its element, while you aren't. In such cases, it would be best to leave the immediate vicinity as quickly as you can without rousing the ire of the snake by making movements that it may construe as threatening. If in the unfortunate event that you are bitten, it is important to seek medical treatment as soon as possible. Keep in mind that snakebites from these varieties cause as many as 12 deaths each year, so it is essential to take such bites very seriously. Which snake is more dangerous? A water moccassin is a cottonmouth. They are very similar but I have handled both of them and when you have them together you can see the difference. Some people also consider the Copperhead snake to be just like them, but again they are not the same. No. No. No... Cottonmouths and water moccasins are the SAME species of snake. There are visual differences among individual snakes within the species... Juveniles are lighter pigmented, and their crossband patterns are more pronounced, wheras adults become darker, and may even appear to be a uniform black or dark brown color, both adult and juvenile present with a white or cream ventral coloration. Copperheads are in the same genus, but are an entirely different species with totally different biological and physiological traits. the color variances are true in many species of snakes. AJ is right. Snakes are not POISONOUS. Snakes are VENOMOUS. Poisons are ingested, or absorbed; venoms are injected (via bites or stings). Monarch Butterflies are poisonous, because they contain toxins that are harmful if ingested. Snakes are venomous, because they inject toxin into their prey via biting. From the title onward, this whole thread is just wrong. Water moccasins are cotton mouths and very poisonous! They are the same snake. 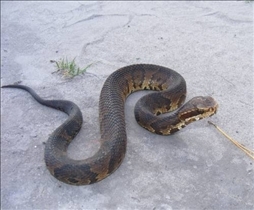 A water moccasin or cottonmouth is highly dangerous as well as the copperhead. They are pit vipers. Basically any snake in water is dangerous and you should avoid it. Copperheads, water moccasins and coral snakes all like water so any snake in water needs to be avoided at all costs. This is untrue. Cottonmouths are semiaquatic. Copperheads and rattlesnake species prefer to remain dry. Other than the word "coral" in their common name, coral snakes are not aquatic, and prefer dry habitats. Coral snakes are not even vipers, they're the only elapid found in the Americas, which is why they have also gained the moniker "the american cobra." While one may not relish sharing a swimming area with snakes, the thought process "all water snakes pose danger to us, so we should fear and avoid them," is absolutely wrong. Other than the cottonmouth (Agkistrodon piscivorus), the only other semiaquatic snakes that share a habitat are harmless, and are often killed out of mistaken identity. Respect nature, but do not fear it, and get your biology straight before you start accusing harmless animals of being deadly. 'American cobra'? Don't think I've ever heard that before. Mind you, I'm not saying I don't believe it. To me, it would seem more accurate to be called American Krait. Coral Snakes don't spread a hood. And they more resemble Banded Kraits than Cobras. I am no snake expert, but I believe the Cottonmouth is a flat blackish/brownish color with a white mouth, while the Water Moccasin is a shiny blackish/brownish color and has a more pinkish mouth. Either way, they are both deadly and have bad attitudes! I believe the title for this should be "cottonmouth vs. copperhead." Water moccasin is another name for cottonmouth, they are the same snake, Agkistrodon piscivorus; the common name varies, but there is only one species of cottonmouth. The copperhead is Agkistrodon contortrix, and sometimes referred to as the "highland moccasin." This is an entirely different species, but they belong to the same genus, Agkistrodon. There is one other species in this genus, Agkistrodon bilineatus, the Mexican Viper, or Mexican Moccasin. All three of these distinct, yet related species belong to the family Viperidae (vipers), and specifically, the sub-family Crotalinae (pit vipers). Common names create confusion, this is why in biology, we must rely on the dichotomy of scientific names to avoid confusion. You're right, they have the title wrong. That may be why some are confused. WATER MOCCASIN is a general term referring to water snakes in general, most of which are non venomous, Cottonmouth is an official common name referencing The venomous pit vipers Genus Agkistrodon piscivorus. This article is flawed because it is supposed to be a comparison btw the cottonmouth and the water moccasin("Water Moccasin vs. Cottonmouth: Know Your Snakes!") . In the section titles habits it becomes a comparison between the Water Moccasin and the Copperhead. I can't speak for everywhere but in the southern US, where all three of these snakes or snake variation are common, this is common mistake. Also I agree that there is a lot more that the article has wrong. For instance, copperhead venom is less toxic than that of the cottonmouth and moccasin. They also live near water but you will never find them in water like you would a cottonmouth or moccasin. As wrong as this article is, it amazes me how much more wrong most of these comments are. Roger-"WATER MOCCASIN is a general term referring to water snakes in general..." Really? Not to be insulting but you need to crack open an encyclopedia sometime. As far as the predominating conversation about moccasin vs cottonmouth, I believe that I have seen some moccasins that don't have white patches around the mouth so I suspect that the cottonmouth is a variety of moccasin. It's worth checking into though as I am basing this on my 50+ years living in the southeast and have heard this argument many times before. You started comparing water moccasin to cottonmouth and then you put copperhead in there while you were trying to explain the cottonmouth. Lots of errors in this article. Also snakes are not poisonous they are venomous. This error alone makes me realize the person who wrote this had no idea what he's talking about. Wow, there is quite a bit of misinformation being written here. Having lived in the south for close to 60 years, I have probably seen, and caught, every snake common to my area. Yes, the title is misleading, and, quite possibly, wrong... depending on your particular location and how you interpret it's meaning - Is the author wrong? Mmm, maybe just misinformed. Let me explain. It would seem that the article is comparing a Cottonmouth to a Copperhead and then making an offshoot comparision to a Water Moccasin. A Water Moccasin is BLACK on the top of its body fading to GRAY and finally to a WHITE underbelly - there are NO distinctive markings on its exterior. A Cottonmouth, on the other hand, has an almost unnoticeably different shaped head - their head rises ever so slightly higher behind the eyes than a Water Moccasin. Admittedly, both of them look identical in their juvenile stage and are practally impossible to tell apart unless you are fortunate enough to have captured one of each. The Water Moccasin can bite you while under water. The Cottonmouth is NOT able to do so. A Water Moccasin is extremely more aggressive than a Cottonmouth, but both are very dangerous when they feel threatened. Water Moccasins will form a huge "ball" in the water when mating (several water skiers have died from falling into a mating ball here) - Cottonmouths do not. Cottonmouths are more of a brownish-gray color and, as AJ stated, can vary in color and markings - this is not so with the Water Moccasins in my area. AJ is the most correct here with his information, but, no offense, only 99% correct. I could break it down more, but I've already gone on long enough. As for the Copperhead, they like rocks and hills and, most certainly live by the water. ALL snakes need water to survive but do not necessarily live by the water. Their water can be obtained by many different methods. Copperheads enjoy the water, but like the Cottenmouth, are only able to bite above water. I Catfish regularly and have Copperheads swim by me about every night I'm out fishing. They have never been aggressive towards me, nor I to them. Just because a snake swims in water doesn't mean it's venomous. However, if you see a snake swimming close to you, do NOT panic! Any species of snake will consider this as threating and most likely become aggressive. Your best course of action is to CALMLY walk, or swim, away making as little disturbance as possible. I've been wading knee-deep and had many snakes swim between my legs without bothering me one bit. Remember... ANY snake can out swim the best of you, and should be considered dangerous at all times. Please overlook my spelling errors. Wasn't a brain day. Is either one considered a rattlesnake? The amount of misinformation in this story is disturbing. If you REALLY want to know about these misunderstood creatures visit "snake id and amphibians of the Appalachians" on Facebook. Don't trust this sites info. It is mostly all false.